Feeling less than your former self? How to reclaim your peak. 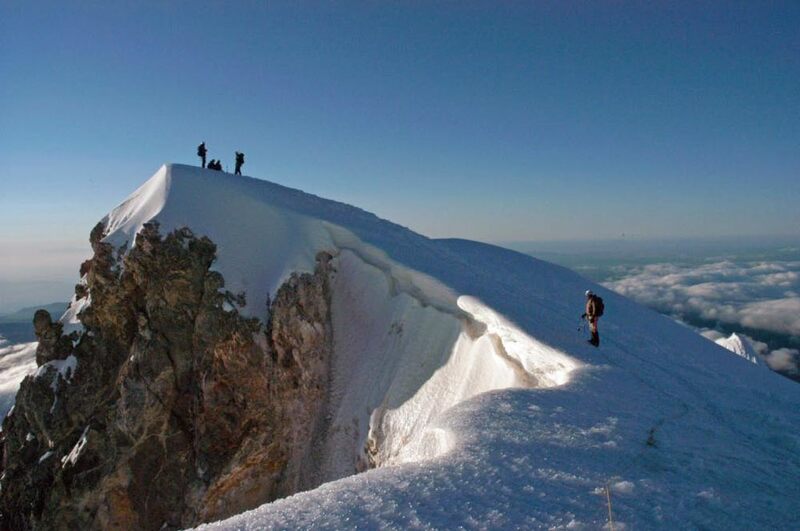 Every year climbers from around the world travel to Oregon to climb the majestic Mount Hood (pictured above), summiting at an elevation of 11, 250 feet. Gorgeous, huh?Have you ever felt like you were standing at the top of your mountain in life and then suddenly it felt like you slid down to the valley? Did you think back to the peak and wonder how in the hell did you ever get there because it doesn’t look easy to get back? Yeah, BEEN THERE. In fact, I felt that way just a few weeks ago after going through a really challenging time and family loss. I felt out of sorts, like I'd lost my groove. And then I realized... I had it all wrong. I didn’t slide off my mountain peak! My soul was at the base of a new mountain. "I lost that part of myself." Base camp for Mount Everest, which soars over several mountain peaks with an elevation of 18,000 feet. From base camp you wouldn't be able to see that you'e 7,000 feet above the summit of Mount Hood. I don’t believe that we ever really slide off of our peak, but instead our souls have climbed high enough that what feels like the valley (or even ocean) floor is actually base camp for a new mountain, or new expansion and growth. The question to ask is, how does my expansion and growth want to take shape? It may take the form of finding forgiveness, exploring a new path in your business or career, or learning how to be gentle with yourself. You might be coming off of a big climb or preparing for a new one. Major life changes, even wonderful ones, can be mentally, physically, and emotionally exhausting. Give yourself permission to rest. Freak outs are common at base camp, so if you're in freak out mode remind yourself that you are not defeated or stuck. Everything happens one moment at a time and one step at a time. If it feels too challenging to relax into it on your own then it might be time to seek out a guide. Consider what you've done in the past that made you feel like you were atop the mountain. Try doing something that makes you feel that way now. Even if it's small - doesn't matter - create the feeling now. Climbers roped up in the dark.4) "Rope up." 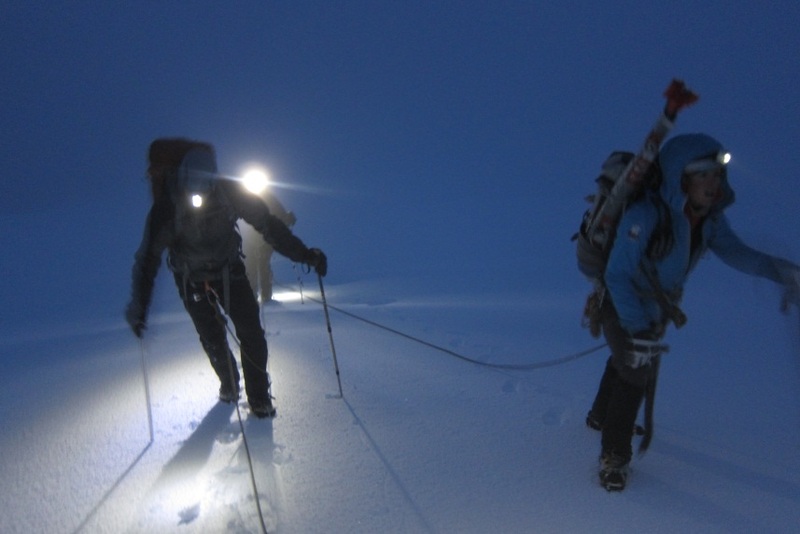 When literally climbing a mountain you can rope up and connect yourself to a team of climbers so that if one slips and begins to fall the others will stop the momentum. In my life I “rope up” too with my collection of support that includes family, friends, coaches, journaling, music, exercise and nature (I've got a lot of them. This is just to name a few). It makes it so much easier to self-arrest for smaller falls. (I can't help myself with these climbing parallels). What does your support team look like for "roping up"? 5) Recognize if you would benefit from a guide, like a life coach. It’s okay if you feel like you’ve been at base camp for a while. It’s okay if you can’t remember your last summit. It may just mean that it’s time for a guide to help you read the map. Truth is, you are your own guide, but a life coach can help you learn how to discover your best course and connect you to your inner, and incredibly wise, guide. Today is the start of a new step. I've found for myself and my clients that with new mountains come amazing new views and gifts. It's on it's way for you. Happy trails to you hiking buddy. How do you "rope up"? Share your story or add to the journey tips in the comment section below. I'd love to hear from you! Newer PostTake a sigh of relief… you can totally fail. Older PostMaybe you can't see that your best work is right in front of you.